So often weddings are NOT fun for the kids when their parents are getting married. Too much stress, being bossed around, told to stay clean, sit down, stop running. Then there are tears, angry words and hard feeling. But THIS video shows a wedding that celebrates the family, involves the kids in fun ways and is STRESS FREE. Matching, cute, yet casual clothes. Countryside setting. Family Unity Sand. Feeding the huge trout in the pond. Exploring the trails. Toasting with sparkling cider. Picking flowers for the brides bouquet. Enchanted Elopement by www.ElopeInOregon.com offers all of this PLUS decorations, photography, champagne, country setting and MORE. Watch this video. You will LOVE seeing the happiness on these kid's faces. Networking online is great but nothing beats in person. That's why I look forward to attending NW Wed Pro Networking Events each month. They meet at a different wedding or event venue on the 2nd Wednesday of each month in the Portland Metro area with a focus on Clackamas County. Members AND non-members are welcome to attend. Portland's best caterers provide food for the event, dessert is often provided by some of the best cake and dessert companies around. There is almost always free wine. Guest speakers teach us everything we need to know to market our business effectively. It's also a great way to view each venue and meet it's coordinator or owner. With a wide variety of professionals attending each month, it offers opportunities to meet, network and partner up with photographers, caterers, florists, officiants, coordinators and planners, Cake and Cupcake companies, venues, DJ's, musicians, photo booth companies, rental companies.... you name it! For a list of upcoming events visit http://www.nwwpnetwork.com/Events.html . Current members are listed on the vendor site at http://www.nwwedpro.com/ . Any wedding or event professional can attend the meetings. All that you have to do is email bmason@ccgmail.net to RSVP. It's that easy. Members pay $10 to attend and non-members pay $20 (membership is only $100 per year) NW Wed Pro's also have the funnest End of Year Holiday Party! No high ticket prices to attend either. Each member contributes in some way to the event with their services or bringing a door prize. For the last 2 years the Holiday Party was held at The Tumwater Room in Oregon City overlooking the beautiful Willamette Falls. It's been a huge success and lots of fun with great food and desserts, music, dancing, games, photo booth, décor and LOTS of great prizes. Must be a member to attend the Holiday Party though. So, if you want to build your business, collaborate with others, get your name out there and have fun too, then NW Wed Pro is for YOU. 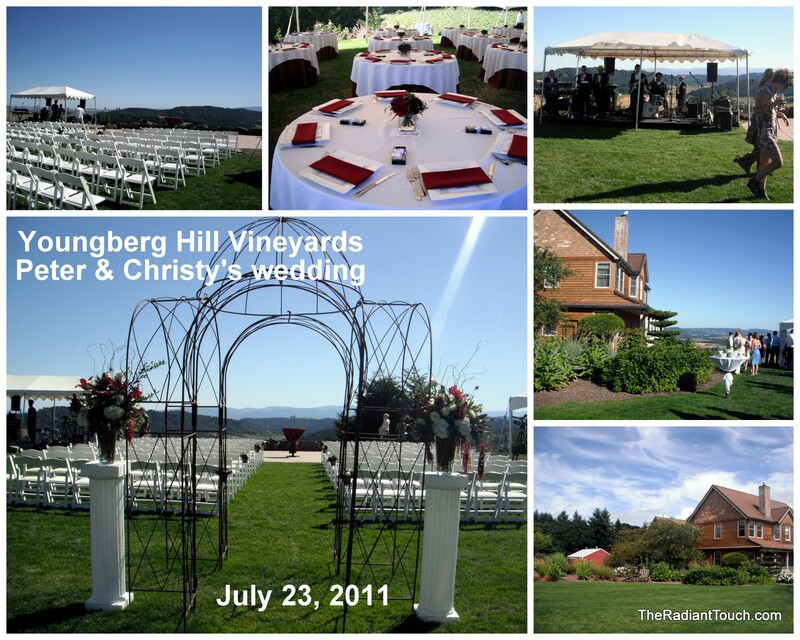 2011 has been an amazing year for weddings. I have had the honor of performing ceremonies in a variety of beautiful locations and the pleasure of working with so many wonderful couples. My "wedding weather karma" came through once again for an entire season. None of my outdoor weddings got rained on and every weding was beautiful. I feel that I am the luckiest person alive to have such a fulfilling and enjoyable career. Some of my favorites though are the elopement packages that I've offered to a few couples. 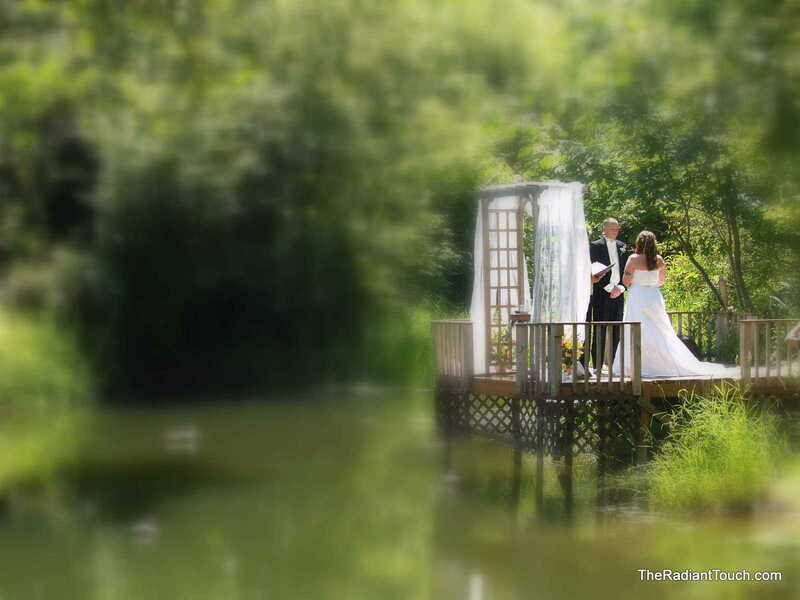 This is a package that includes location (my 11 acres of wooded paradise in the country with the ceremony on the custom built dock of a trout pond), Officiate, custom ceremony and vows, 1 hour photography on CD (2nd photographer for during ceremony) champagne toast and beautiful decor. It turns an elopement into a dream wedding for the couple and up to 10 of their closest friends & family. Skamania Lodge Postlewait's Country Gardens Laurelhurst Club Edgefield Youngberg Hills Vineyard Weatherfords Grand Lodge Peninsula Park Abernethy Center & Gardens Rockaway Beach Deepwood Estates Canby Ferry Vista Hills Winery Kennedy School Pioneer Community Center Cedar Springs Country Estate and many many many wonderful weddings in homes and backyards. 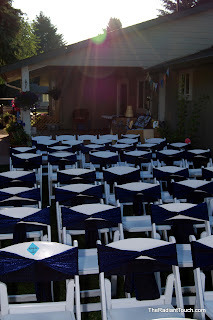 Every wedding is special and unique no matter the size or the location. I have one more ceremony this fall that I am looking forward to most of all. 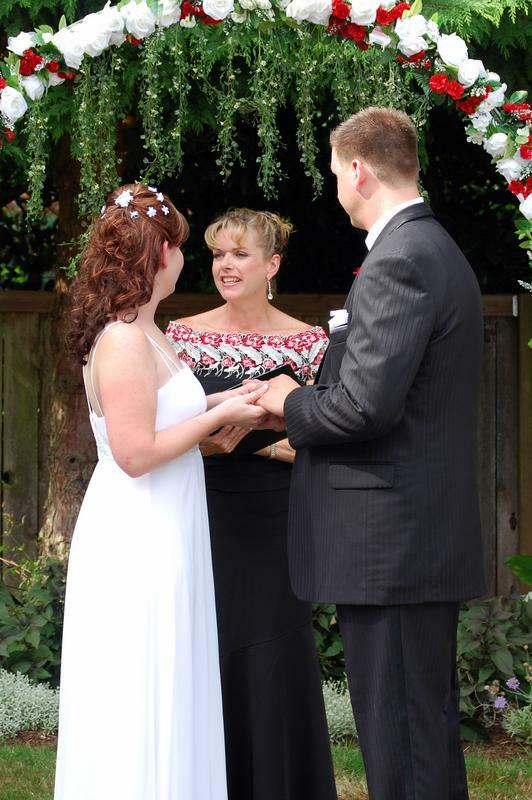 That will be my 15 year Vow Renewal ceremony to my wonderful husband. On October 12, 2011, Gene and I will be renewing our vows on the beach of Maui with 12 of our closest friends. Rather than exchanging rings, we will exchange leis as we say our vows to each other. The ceremony will be performed by my dear friend Tonya Koski of Top Hat Style Weddings in Tri-Cities, Washington. The photography will be provided by my friend Juston of CardwellPhotography.com. Hair and makeup will be done by my friend Janee', owner of Shears2You in Oregon City. Best Man and Maid of Honor will be our two best lifelong friends, Dr. Michael Coffman and Ms. Lynn Yut. My honorary attendants will be Stefanie, Patti, Robbie, Laura Lee and Lynette. They will all be wearing Carribean Blue. I will be walking down the aisle to Bruno Mars, "Just the way you are" and finishing up with Colbie Callet singing "I Do". The rest of the week I plan to relax, play and have fun. Snorkeling is my all-time favorite activity in Hawaii. I will not stress or obsess over ceremony details once we get there (hopefully) and just keep it fun and casual. Thank you for following my Blog and I hope that you have had a wonderful year also!! I found my dream destination wedding gown last January at the Brides Against Breast Cancer gown sale in Portland, Oregon. It is in ivory and that's all I'm telling! You'll just have to wait for photos. I just wanted to send you a little something before I forget. A simple thank you would never be enough to express my deepest regard to you for the beautiful ceremony you performed. 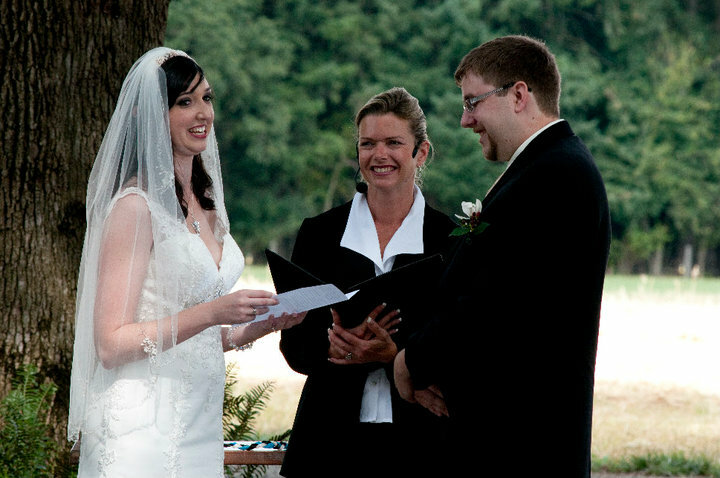 So many of our guests commented on you and the words and just everything about the ceremony. For not knowing exactly what I wanted, you did exactly what I wanted. You got me and Kyle and captured it so beautifully in the ceremony. We are so happy you were the one to marry us! The "icing on the cake" was our small world moment from my mother's wedding and I just am so glad you were there. Thank you again for all your help, you truly made our day magical and there wasn't a dry eye in the house!! Thank you Breezie and Kyle! It was my pleasure to perform your ceremony and coordinate the rehearsal. I loved the fact that I had attended your mother's wedding and now am performing yours. Very small world. It was so nice to see all of you girls all grown up into such beautiful women. Wishing a wonderful marriage and life together. 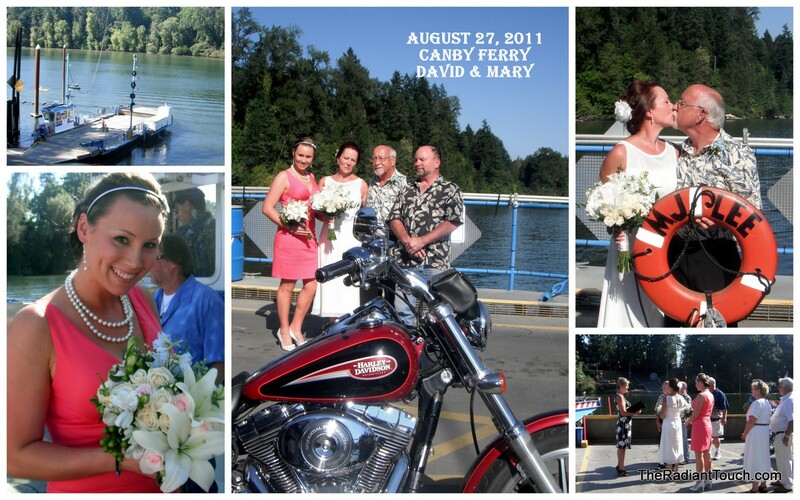 Recently I was asked to perform a wedding on a Ferry in the middle of crossing the Willamette River. Yes! Of course I will. I love new and unique wedding ideas and locations. It was a beautiful yet very HOT August day. Once we were out in the river the temperature felt much better and the breeze off the water was nice.